Manufacturers are always looking to streamline their processes, track progress, and foster collaboration among their employees. G Suite is the productivity tool that can improve management of the various processes that take place in manufacturing because of its capabilities for collaboration. The tool is also handy for automating the flow of information. Communication has always been the key to collaboration. In addition, when it comes to production, it helps when team members can visualize the product being designed. Sometimes, the team members are spread over various locations. In these cases, they can chat through Hangouts and share their input. Project files can also be shared on Google Sites so that teams can collaborate from different locations seamlessly. Collaboration can be limited to the upper echelons of management and this creates some bottlenecks. It is only when workers in the production line know what to do that the process becomes seamless. Production line employees can ensure quality products if they have access to real-time information on changing needs and requirements. Supervisors on the production floor can send out quality alerts and the production teams can follow any updates on their devices. This can include live production data, which helps teams know when an issue arises without the need for calling or texting each other. Manufacturing involves many stages. Each stage needs to be recorded accurately for quality purposes and record keeping. Most enterprises have found this process to be time consuming and inefficient. Many times, supervisors have to note down information on paper and then go and feed this information to a computer. With G Suite, information is easier to manage. Supervisors can feed information about production directly to Sheets or Forms where it is immediately accessible. The information from Forms can be exported to Sheets. 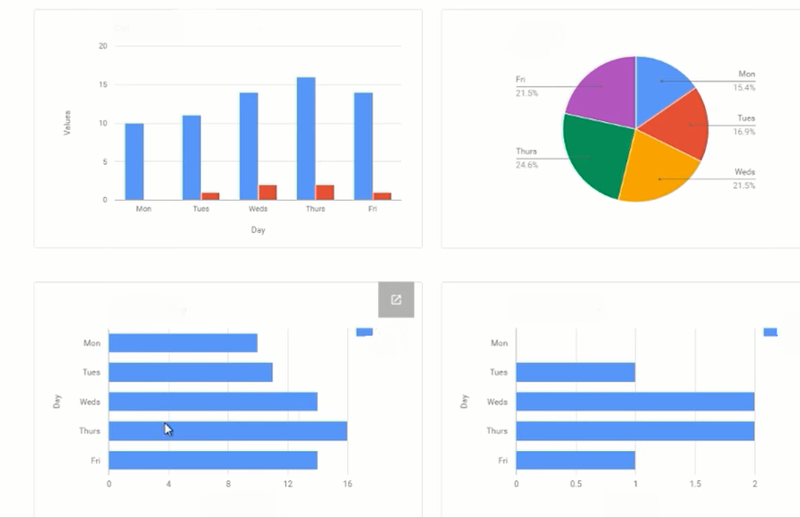 If five supervisors fill in information using Forms, all of the data collects in a single Google Sheet for analysis. This information can include live production data that will show how many products are coming out of each line. The data can be displayed graphically so that those working in a specific line can easily determine how quickly they are producing items. This allows teams to find any slow-downs in production immediately. The steel company POSCO deploys G Suite to increase its efficiency. The search feature on G Suite has made information available to members of staff easily. The company also uses tools like Gmail and Calendar to schedule tasks for teams. Workers use Hangouts for communication. G Suite has minimized interruptions so that staff can focus on the production process. POSCO has done away with its old manual post-it system and is enjoying a rise in productivity since deploying G Suite. Whether a company has one site or multiple sites, products can be uniform. Important information such as assembly manuals can be shared remotely with the relevant teams for consistency. Some manufacturing sites require a lot of communication and collaboration. When managers are on the production floor, they get inquiries from various departments within the company. These inquiries range from product specifications, data, strategy, and even current performance. If the managers share the relevant information on Drive, they can cut the number of these inquiries down because most files will already be displayed to interested parties. This is the case with Shaw Industries where production managers carry a tablet or smartphone and receive alerts on events taking place throughout the production floor. This keeps them updated so that they can plan better, answer questions, and share information easily. When Orbotix launched Sphero Rangers to teach kids how to program using Sphero robots, they could not visit every school. They did the next best thing; create a training deck using Google Presentations. This is applicable to manufacturing as well as other aspects of business. Training materials may need to be shared with groups such as client technical teams or regulatory bodies. When manufactures share the information through G Suite, clients and other interested parties can see any updates and changes in real time. G Suite provides efficient collaboration plus other useful capabilities. The most significant benefit of G Suite is that it is ready for use within the organization. This means a low cost for deployment for anything from training to customizing. G Suite also reduces the amount of money spent on transport and communication. Rather than calling, a worker in the production line can send out alerts and reach the target audience. In addition, G Suite reduces the IT concerns and the amount of IT staff needed to manage the systems. Its cloud capabilities also provide backup. Some customers need custom made items. That is why salespeople had to carry brochures with different prototypes when pitching to clients back in the day. Today, the information is available in digital format. This is where G Suite takes things a step further. It enables on the spot personal service. A salesperson can whip out their smartphone and access files that include all product information. If the prospect wants more details or designs, a quick call on Hangouts between a product manager on site and other stakeholders can be arranged to discuss the designs and come up with a suitable solution. The Adhunik Group set up cameras on their production sites. When handling customer order inquiries, they show customers real-time production footage of their items. This is a simple yet efficient way of reassuring customers. The transparency also builds trust. Many manufacturers hold trade secrets that must be kept from competitors. Users can set up G Suite to compartmentalize information. Only those who must have access can be allowed access to files. The filtering feature for G Suite also ensures that workers cannot share information outside the organization via email. Google has a mobile device management feature that controls the use of work devices. It includes restrictions on who can access devices and where those devices can be used. Admins can also wipe data remotely or lock out users from devices if the need arises. Google has rolled out another service where it certifies mobile devices for enterprise use. Such devices remain secure through a combination of measures to protect sensitive company information. G Suite has a large collection of tools. It also allows for various customizations using App Scripts and third-party integrations. All of these tools can help a manufacturer to uniquely solve their productivity needs. That is why each manufacturer needs to identify their needs and set out clear goals. Then, G Suite will help them achieve and sustain excellent processes and foster a collaborative working environment. A G Suite trusted partner since 2014. More than 750 plus clients have migrated to the G Suite platform, and we continue to support them.